This PDF 1.7 document has been generated by PDFium, and has been sent on pdf-archive.com on 27/04/2018 at 19:06, from IP address 191.254.x.x. The current document download page has been viewed 166 times. File size: 948 KB (15 pages). reading pressure over the specified full scale pressure span and temperature range. errors (which include non-linearity, repeatability and hysteresis) using an on-board Application Specific Integrated Circuit (ASIC). Calibrated output values for pressure are updated at approximately 1 kHz for analog and 2 kHz for digital. operation from a single power supply of either 3.3 Vdc or 5.0 Vdc. 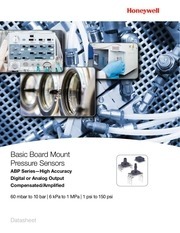 These sensors measure gage and differential pressures. The Basic Amplified pressure sensors are intended for use with non-corrosive, non-ionic gases, such as air and other dry gases. The following options extend the performance of these sensors to non-corrosive liquids. alumina ceramic, silicon, gold, and glass. Silicone gel coating: Uses the same materials in the wetted media path but is protected from condensation by a siliconebased gel coating; allows use in applications where condensation may occur. All products are designed and manufactured according to ISO 9001 standards. Absolute maximum ratings are the extreme limits the device will withstand without damage. Life may vary depending on specific application in which the sensor is used. Contact Honeywell Customer Service for detailed material information. Output is proportional to the difference between applied pressure and atmospheric (ambient) pressure. Output is proportional to the difference between the pressures applied to each port (Port 1 – Port 2). Sensors are either 3.3 Vdc or 5.0 Vdc based on the catalog listing selected. Ratiometricity of the sensor (the ability of the device output to scale to the supply voltage) is achieved within the specified operating voltage. The sensor is not reverse polarity protected. Incorrect application of supply voltage or ground to the wrong pin may cause electrical failure. Operating temperature range: The temperature range over which the sensor will produce an output proportional to pressure. Temperature Output Option: Continuous operation in Sleep Mode only may provide different results. all errors due to pressure non-linearity, pressure hysteresis, and non-repeatability. Full Scale Span (FSS): The algebraic difference between the output signal measured at the maximum (Pmax.) and minimum (Pmin.) limits of the pressure range. Transfer Function “A” is shown. See Figure 3 for other available transfer function options. transfer function, no temperature output, no sleep mode, 3.3 Vdc supply voltage. Copyright © 2015 Honeywell International Inc. All Rights Reserved. The transfer function limits define the output of the sensor at a given pressure input. function in Figure 2 of the product datasheet. 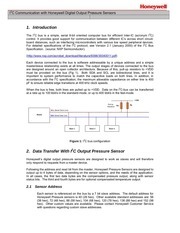 See the explanation of sensor pressure types in Table 4 of the product datasheet. exposure to any pressure beyond the burst pressure. span, pressure non-linearity, pressure hysteresis, repeatability, thermal effect on offset, thermal effect on span, and thermal hysteresis. This file has been shared by a user of PDF Archive. Document ID: 00761873.